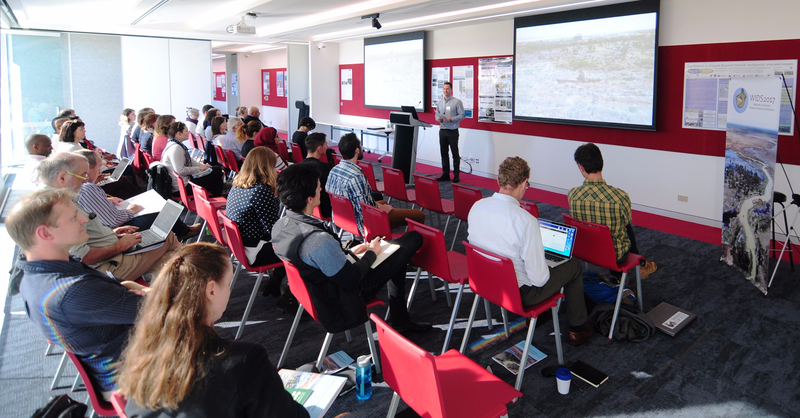 The 2nd Wetlands in Drylands (WiDs) meeting took place at Macquarie University in Sydney, Australia, between 24-26th July 2017. 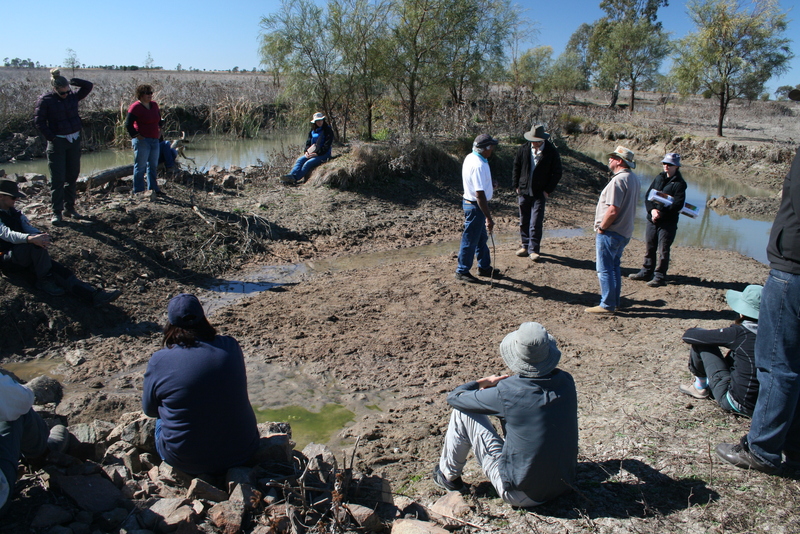 Organised by Tim Ralph, the meeting involved presentations and breakout group discussions, and was followed by a four-day excursion to the Macquarie Marshes in inland central New South Wales. Following on from the inaugural WiDs meeting held near Parys, South Africa in November 2014, a meeting that led to formation to formation of the Wetlands in Drylands Research Network (see http://wetlandsindrylands.net/), this post is an attempt to cast a perspective over the activities. 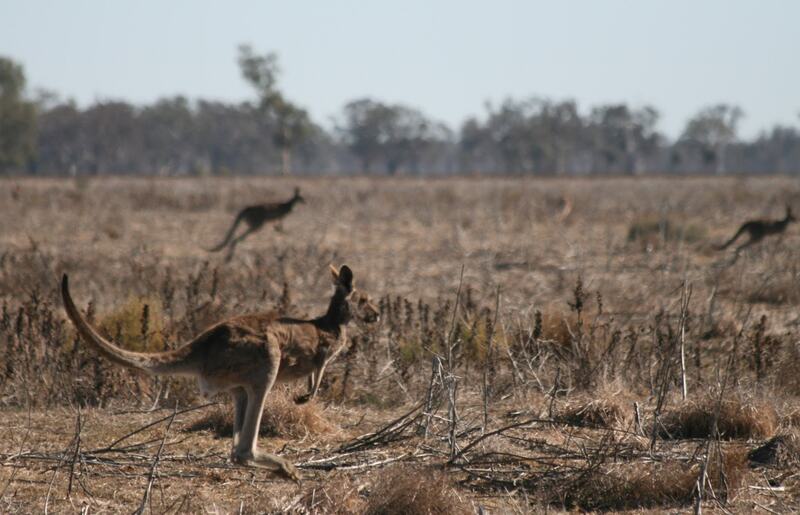 The activities provided an opportunity not only to assess progress in wetlands in drylands research since the Parys meeting, but also to place these activities against the backdrop of more than two decades of research and management in the Macquarie Marshes in particular. A day-by-day outline of activities at Macquarie University is provided elsewhere (see http://wetlandsindrylands.net/latest-posts/). Stepping back a little, it is noteworthy that compared to the Parys meeting, which was specifically for 16 UK and South African wetland researchers alone (this was a stipulation of the catalysing funding scheme), the Macquarie meeting was larger (~50 attendees) and more diverse. A common lament at the Parys meeting was the absence of involvement from other people whose social and professional lives revolve around wetlands in drylands (e.g. representatives of local community groups, subsistence and commercial farmers, wetland managers and policy makers). Most wetlands in drylands are living and working landscapes, such that the relatively new term ‘social-ecological system’ can be readily applied. While blue-skies wetland research remains important, in many instances this can benefit from, and dovetail with, additional perspectives. But thanks to Tim’s sterling organisational efforts, the Macquarie meeting and the associated excursion was blessed with inputs not only from wetland researchers spread across four continents but also from additional constituencies: wetland managers and policy makers, wetland landholders, and – importantly – representatives of the Traditional Owners of the Macquarie Marshes (the Aboriginal Wayilwan nation). As befitted the meeting theme of ‘Dynamic Landscapes’, specialist sessions focused on hydrogeomorphological, biogeochemical and ecological dynamics, and the resilience and sensitivity of wetlands in drylands, but later sessions were set aside to consider the interactions between science and management, and indigenous knowledge and management. As a consequence of this diverse involvement and structure, discussions following presentations and in the breakout groups were considerably enriched, with particular attention focusing on how best to build and maintain strong relationships between scientists, managers and other stakeholders to address the many challenges facing wetlands in drylands. What are the main barriers to, and opportunities for, communication and sharing of wetland knowledge and insights? How best can wetland researchers translate findings into forms that can be assimilated by wetland managers? To what extent should management concerns help to shape wetland research priorities? Can environmental water flow releases from reservoirs work in synergy with ‘cultural flows’ to enable maintenance of local customs associated with water (e.g. fishing)? And how can cultural perspectives on wetlands – oral histories and the like – be dovetailed with scientific perspectives? 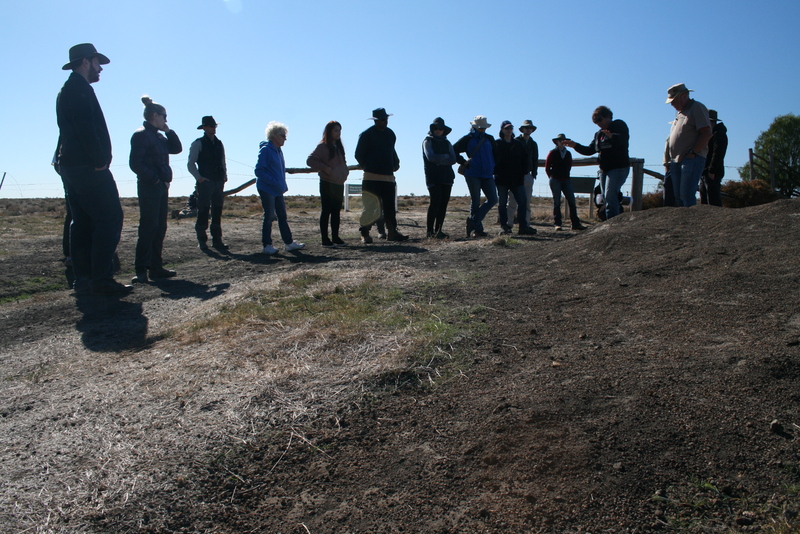 The excursion – dubbed the ‘Macquarie Marshes Research Outreach Event’ – provided an opportunity to continue such discussions in a specific field setting. This is one of Australia’s iconic wetlands in drylands, known especially for its diverse aquatic and semi-aquatic habitats that occur amidst the otherwise dusty, semi-arid plains of inland New South Wales. Internationally, these wetlands are best known for their periodic profusion of waterbird populations, which in large part led to their 1986 listing as a Ramsar Wetland of International Importance (https://rsis.ramsar.org/ris/337). Fed largely by seasonal rainfall gathered in its southern headwaters, historically the Macquarie River flowed freely northwest and north past towns such as Wellington, Dubbo and Warren, eventually disgorging its water and sediment amongst a confusing tangle of active and abandoned channels, marshlands, swamplands, floodplains, woodlands and lagoons. In particularly wet years, the extent of flood inundation could expand to around 3000 km2 (300 000 ha) – an area roughly fifty-five times the size of Sydney Harbour or 1% of the total area of the United Kingdom – only to shrink back to much smaller areas of more-or-less permanently wet, ‘core wetlands’ during drier years. Such a wetting-and-drying dynamic is the natural norm in inland Australia’s highly variable climate, and is associated with a well-adapted boom-and-bust ecology. The local Aboriginal peoples would have known these rhythms well, adapting their cultural practices accordingly. But European explorers and colonists took far longer to appreciate them. In 1818, John Oxley arrived at the edge of the marshes in flood and turned around, concluding that he had arrived at an inland sea. A decade later, Charles Sturt came during a drought and found largely dry floodplains, albeit ones dotted with small waterbodies, concluding instead that only in very heavy rains could the marshes and adjacent lands be inundated. Even with the benefit of nearly 200 years of collective hindsight, fleeting visits still colour many people’s perceptions of the value of wetlands in drylands. The marshes offer a very different personal experience in a wet year compared to a dry year, but both are needed for a fuller comprehension of the system’s workings. And like many other wetlands in drylands around the globe, the absence of this longer-term perspective has been partly culpable for a steady decline in the health of the Macquarie Marshes, whether this be measured in terms of tree deaths, reduced diversity of vegetation and fish communities, or declining waterbird numbers. Upstream dam construction and associated flow regulation, urban and agricultural flow extractions, and creeping encroachment from irrigated lands have all taken their toll on the marshes. To this toxic mix, add complications from river and floodplain engineering schemes, marsh-dissecting roadworks, and greater flow variability resulting from climate change, and their declining health should come as no surprise. In short, apart from a few areas of the marshes where inundation is now more-or-less permanent (and somewhat ironically can result in tree deaths and adverse soil geochemical changes), in many other parts, flooding events are now less frequent and less extensive, while desiccation events are becoming more frequent and more severe. Roughly 90% of the Macquarie Marshes is now in private ownership, with the remaining 10% in protected areas, most notably the Ramsar-listed Macquarie Marshes Nature Reserve, but even these sorts of designations have not provided immunity from the overall health decline. The two main portions of the reserve (southern and northern) are not accessible to local people or visitors from farther afield, so many of the deleterious changes that have taken place within the southern portion especially – desiccation, tree deaths, channel erosion, and so forth – have gone largely unnoticed. In itself, this lack of public awareness is part of the problem. In a 1992 commentary in the National Parks Journal, Bill Johnson (a former ranger with the NSW National Parks and Wildlife Service) argued that that while there was a need to halt many of the processes contributing to their decline and to begin restoration, the long-term viability of the Marshes is “totally dependent upon the involvement of the wider community in the management of the wetlands and the Macquarie River”. An Australian Geographic article from March 1996 provided a snapshot of conditions in the marshes, highlighting the rich birdlife in particular, but not shying away from reporting some of the negative ecological changes, including tree deaths, waterbird declines, and the spread of invasive species such as the European carp and feral pigs. It also sampled a wide range of local community views on the management of the marshes, including a quote from a now-departed local resident: “If people can’t visit the marshes, they won’t care about them”. In this respect too, personal experience is vital for influencing perceptions of the value of wetlands in drylands. These articles were published during the 1990s when La Niña conditions were still generating moderate rainfall and flooding. In retrospect, this decade might be referred to as the last heyday of the marshes. Ecological health worsened dramatically during the ‘millennium drought’ (c. 2001-2010), but has improved slightly in recent years, as a new La Niña phase has led to the return of moderate flows. Intense competition for water has remained, however, and the policies and practices for water allocation and distribution have undergone further evolution. So two decades or more later, where do we stand against the views and opinions expressed by an earlier generation of marshes managers and residents? Has any progress been made against the calls for greater community involvement, and for closer working between scientists and managers? Has scientific research provide any traction with the issues of negative ecological change? Have channel and floodplain restoration efforts succeeded or failed? Are there improved policies to balance the competing demands for water? And how have local community perspectives fared within the negotiating rooms? The excursion to the Marshes provided an opportunity for myself and others to ponder these sorts of issues. And it’s mixed news. Thanks especially to the work of Tim Ralph, his academic colleagues and students, our knowledge of the geomorphology, sedimentology, and environmental history of the Marshes has improved considerably. 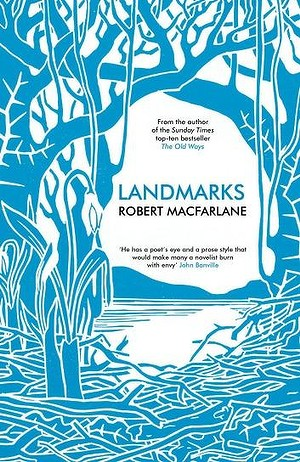 Along with important contributions from other research groups, the links between landforms, earth surface processes, and ecological functioning in the marshes are now much better known, albeit still incomplete. There is, for instance, much greater cognisance of the intrinsic dynamism of these ‘wandering wetlands’ and how lateral channel shifts, erosion and sedimentation can lead naturally to changes in wetland location and extent, regardless of conservation boundaries (http://www.environment.nsw.gov.au/news/keeping-watch-over-a-wandering-wetland). Suggestions that the degraded and drying southern portion of the Nature Reserve should be abandoned in favour of focusing efforts on the wetter northern portion can be rebuffed with the argument that a longer term perspective is needed: wait for the next lateral channel shift, keep patient during the drought, and wetter conditions will likely return. Some of these insights have been implemented in management policies and practices. Some attempts at restoration of parts of the marshes have failed, even threatening the Ramsar status of the Nature Reserve (see http://www.environment.nsw.gov.au/wetlands/20130104mmrsart32.htm), but lessons have been learned and are being incorporated into management practices (e.g. 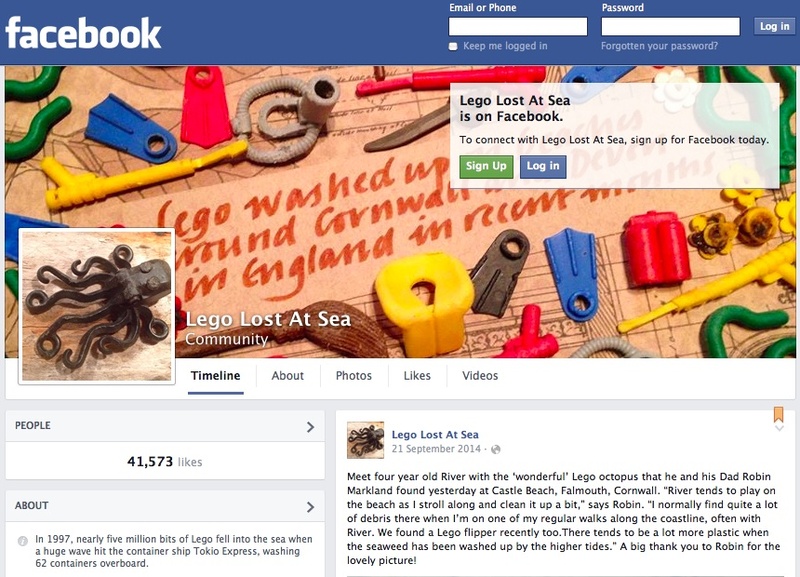 improving the design of channel-spanning weirs). Some private landowners are fully on board with attempts to better understanding the landscapes and ecosystems of the marshes, and readily facilitate scientific research efforts. While the Nature Reserve is still not publically accessible (a decision that seems to be based mainly on attempts to exclude unwelcome visitors such as illegal pig hunters), local community (including Wayilwan) perspectives are now given greater prominence in round-table discussions about the management plans for the reserve and the marshes more widely. Progress on other issues remains unclear, at least to me. In a short visit of only two full days, it was impossible for me to get my head around the intricacies of the current marshes water allocation and distribution system, let alone its long and complex history. Each year, many tens or hundreds of thousands of megalitres of water are released from the Burrendong Dam, but this is divided between environmental flows, irrigation flows, by pass flows and so on …. it’s a complex terminology with complex definitions that is coupled with complex demands competing in a complex social web. All that is best left for others to elaborate on (see http://www.environment.nsw.gov.au/environmentalwater/macquarie-profile.htm). Similarly, local issues of environmental management and social justice can’t be debated and resolved in a few quick conversations: for instance, just when do we intervene – or not intervene – in natural process such as channel abandonment and flow diversion, and how do we compensate those downstream users who may be deprived of water, or inconvenienced by changing flood patterns? But the main point is that rarely can science and management be divorced from social context and consequence. Even if answers can’t be provided immediately, approaches to a search for solutions can be outlined, at least in theory: namely, the need to facilitate ongoing communication, dialogue, and exchange of ideas between different scientists, managers, local community groups, and other stakeholders. There is no simple recipe for doing so, but discussions at the meeting and on the excursion provided anecdotes and case studies to highlight at least some best practice principles. Building trusting relationships by taking the time to listen to people’s views, engaging with environmental education projects in local communities, and organising open field visits such as the Macquarie Marshes Research Outreach Event …. none of these are magic bullets, but they can help lay the foundations for moving forward. 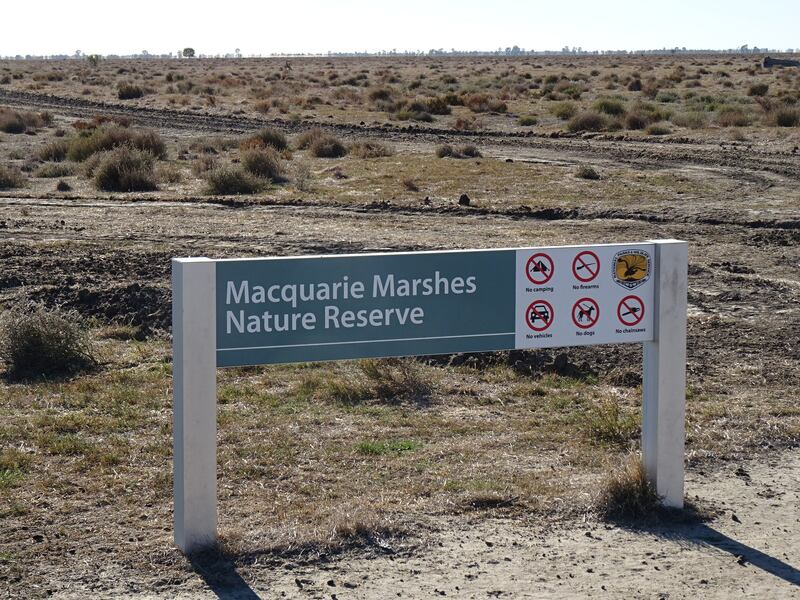 And in the Macquarie Marshes, many of the foundations are there already, not least because there seems to be sufficient shared concern about the future of the marshes for people to be open to ongoing communication. Maintaining and building on these foundations is a constant challenge. As discussions in the field, around the campfire, and on the bus home unfolded, it struck me that people within living and working wetland social-ecological systems enter and depart the scene, much like many of the waterbirds come and go with floods and droughts. 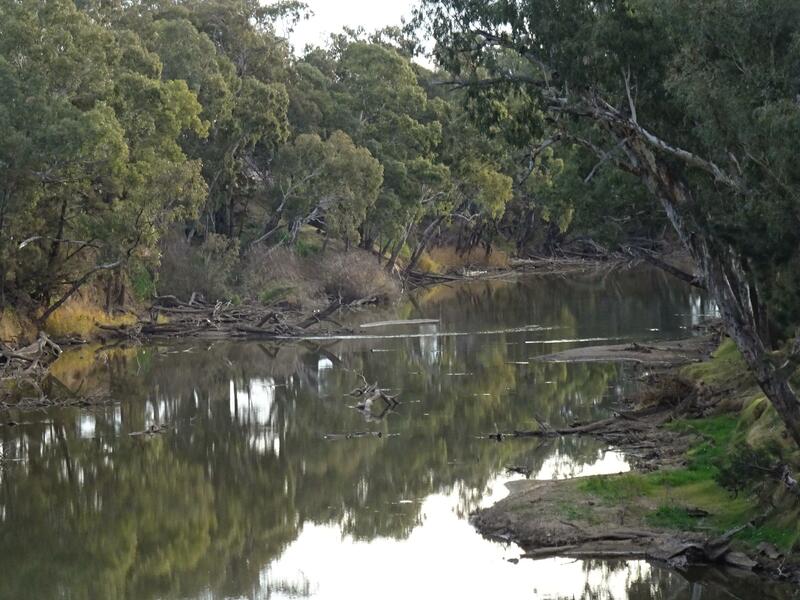 Like stately River Red Gums that line the Macquarie River banks, some individuals, families, social groupings and institutions provide continuity across the decades, persisting through cycles of flood and drought and withstanding the changing water allocation and environmental management frameworks. But like Bill Johnson and others that frequented the Macquarie Marshes in the 1980s and 1990s, many move on or pass away. Other people take their place, but with each entry and departure, knowledge and wisdom has to be re-learned and trusting, working and social relationships have to be rebuilt. Of course, such issues are not unique to the Macquarie Marshes. Institutional policies and practices can provide some sort of inherited memory and learning to enable ongoing progress, regardless of individual involvements. In environmental management circles, ‘adaptive management’ is now the mantra. Adaptive management practices acknowledge that despite uncertainty, decisions must be made and actions implemented, but emphasise learning from the outcomes to inform future decision making. The Macquarie Marshes has its own adaptive management plan (written by Bill Johnson in a new role – see http://www.environment.nsw.gov.au/resources/environmentalwater/100224-aemp-macquarie-marsh.pdf), something that may well be essential in managing for a future that seems to be getting just a little more uncertain with each passing year. Let’s hope that in two decades or more, a retrospective similar to the one attempted here will provide positive rather than negative commentary on the state of the Macquarie Marshes social-ecological system. Footnote: I gratefully acknowledge sponsorship from the NSW Office of Environment and Heritage (OEH) and Macquarie University for the Macquarie Marshes Research Outreach Event. I also thank OEH staff, local landholders and representatives of the local community for their support and participation. I thank Tim Ralph in particular for additional discussions and suggestions. While informed by discussions on the excursion, the views expressed in this post are of course my own. New Scientist recently ran an interesting competition: can we help shape the linguistic direction of the Anthropocene? In the spirit of ‘Landmarks’, a book of terms for natural phenemona, Robert Macfarlane had pondered the words that might belong to this proposed new geological time interval (https://www.newscientist.com/article/mg22830523-200-desecration-phrasebook-a-litany-for-the-anthropocene/). What new words will we need to describe the planet in the Anthropocene, and which words will die? Macfarlane made some preliminary suggestions for a ‘desecration phrasebook’ (e.g. ‘trash vortices’ to describe the plastic garbage patches that swirl in ocean gyres …. ‘plastic soup’ is another possibility – see https://stephentooth.wordpress.com/2015/01/10/plastics-plastics-everywhere/) and pondered whether we yet have words to describe the rain that falls when a cloud is seeded with silver iodide or the glistening tidemarks that are left on coastlines by oil spills. Had I been aware of the mid-January deadline before it had passed, I might have entered the competition with some suggestions of my own. Anthroposcene – the hubbub of debate and activities that loosely revolves around the idea that humanity may have created a new geological time interval. [Nb. this is a term already adapted by at least two Facebook discussion groups – AnthropoScene and The Anthropos.Scene]. Anthroposense – intelligent, intelligible opinions that are expressed about the putative new geological time interval, whether one agrees with a formal definition of a term or not. Nonthroposense – the polar opposite of the above. Anthroposcenic – landscapes that have come to be viewed as picturesque (i.e. ‘scenic’) but that actually are in a far-from-natural, highly-altered state (e.g. 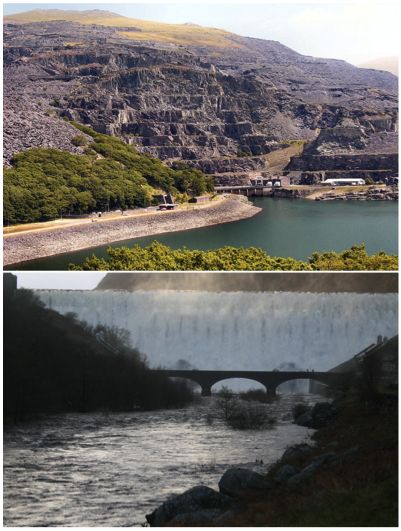 the reservoirs in the Elan valley of mid Wales – see http://www.eurig.cymru/elan-valley–january-2016.html). [Nb. in a recent RGS-IBG presentation, this term has been used in a rather different sense by David Matless to mean specific landscapes that have become emblematic of environmental transformation, such as where houses and graveyards have become undermined by coastal erosion, or where buildings and fields have been drowned by rising sea levels. To this alternative definition, one could also add the examples of buildings and fields drowned by rising waters behind human-constructed dam walls (e.g. Treweryn or Elan valleys in Wales), which in turn may have become Anthroposcenic in my sense of the term (certainly not to all, but to some)]. Anthroposore – a variant on ‘eyesore’, to reflect a more-or-less permanent sore, scar or wound on the Earth’s surface and geological record that has resulted from human activities (e.g. open cast mining, or land contamination and water pollution resulting from a legacy of mining activities). Glasstic load – clastic sediment (e.g. 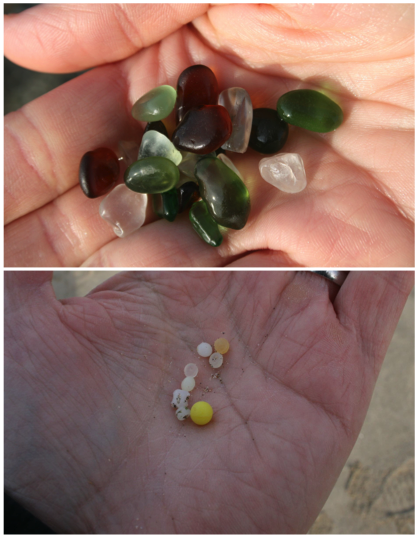 sand- and gravel-sized material) that now contains a significant component of human-made glass (e.g. beach sediments in Aberystwyth – see https://stephentooth.wordpress.com/2015/10/29/10-reasons-why-10-rheswm-pam-8/). Plastic load – as above, but with plastic instead of glass forming a significant component of the clastic sediment. 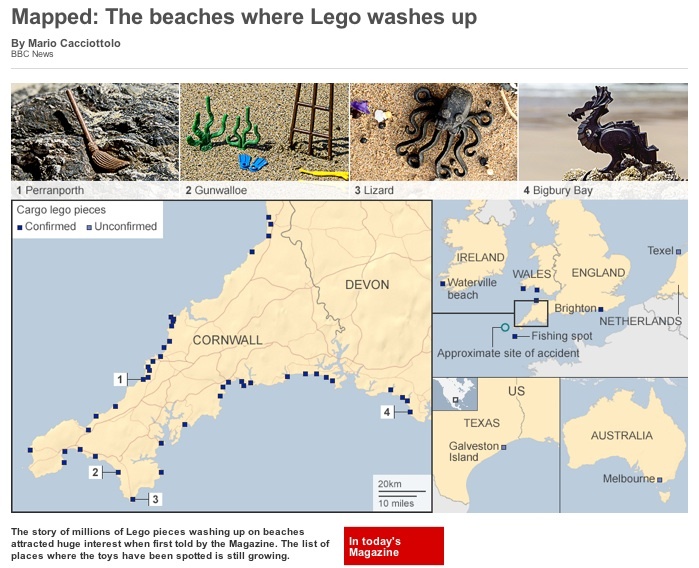 The Plasticene – an alternative name for the Anthropocene, if the main signature of human impacts on the Earth’s geological record is taken to be a widespread plastic horizon in sediments formed from about AD 1950 onwards. [Nb. this is likely too similar to the already-existing, formal geological term ‘Pleistocene’ for this one to ever stick but, hey, we’re playing with words here]. The Capitalocene – a term that formally acknowledges the fact that the main driver of changes to the Earth’s environment – and potentially its geological record – has been the rampant growth of capitalism. The Hollowscene – a play on the already-existing, formal geological term ‘Holocene’ to indicate the geological epoch preceding the Anthropocene (or Plasticene or Capitalocene), left forlorn and bereft of meaning and purpose (assuming a formal declaration of the Anthropocene). And finally, what about some new collective nouns or verbs? A refuse (a garbage? a detritus?) of gulls – the flocks of gulls that wheel, squeal and squabble at rubbish/trash dumps. 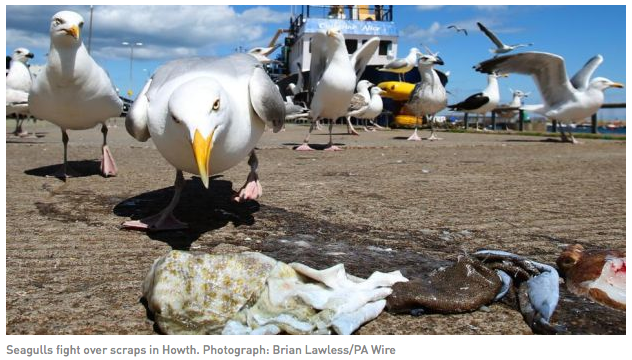 A gangsta of gulls – the menacing squads of gulls that have become too used to human handouts and now hover around and/or stalk people eating at popular attractions (e.g. seafronts). To be gulled – a mugging by a gull (e.g. food stolen but no personal injury). If anyone can add to or better these terms, I will be interested to receive suggestions, and might even feature some on a future blog. This is a bold claim indeed. But what exactly is the profound shift that is referred to? The Anthropocene (from anthropo– for ‘human’ and –cene for ‘new’) is a term that has been proposed to signify the pervasive role of human activities – air pollution, species translocations, ploughing, mining, damming, dredging and construction, among many others – in influencing atmospheric, biological, and land surface changes. Some of these changes appear to be ‘dominating’, ‘overriding’ or ‘overwhelming’ natural forces, and to be sufficiently significant and permanent to have shaped Earth’s recent and potential future geological record. In short, have we now exited from the Holocene epoch (the present interglacial time division that started around 11 700 years ago) and entered a new geological interval, one defined by humanity? The answer to this question, and thus as to whether the Anthropocene should be formally adopted as a new, uppermost time division in the geological column, is still subject to vigorous debate. Some geoscientists remain unconvinced of the justification, practicality or utility of a formal adoption (for an extreme viewpoint, see: http://theconversation.com/enough-anthropocene-nonsense-we-already-know-the-world-is-in-crisis-43082). Amending the current subdivison of the geological timescale is a slow, contentious business, although a judgement from the International Commission on Stratigraphy is expected sometime in 2016. But beyond geological committee rooms, the answer – whether positive or negative – also has philosophical, ethical and moral dimensions, with implications for debate and practice across the natural sciences, social sciences, humanities and arts. 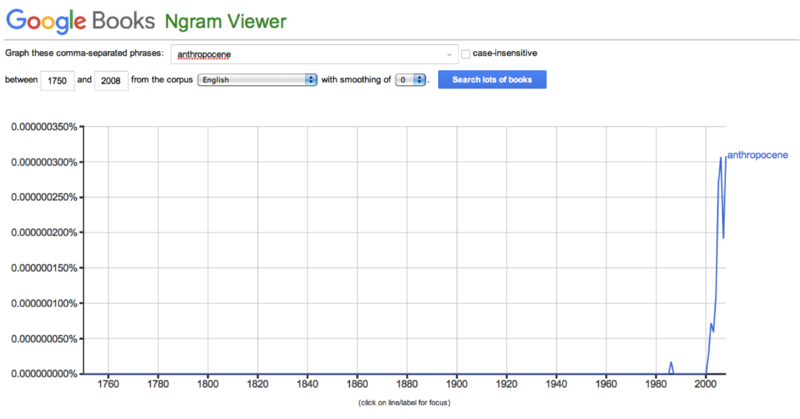 For this reason, use of the term ‘Anthropocene’ in printed literature has seen an explosive rise (neatly charted by Google Books Ngram Viewer) since Crutzen and Stoermer first outlined its geological significance in Global Change Newsletter (v.41, 2000), a short but influential article that prepared the ground for subsequent debate and speculation. To provide our own perspective on this rising tide of Anthropocene-related debate, visual artist Julian Ruddock and I recently held a one-day symposium entitled ‘Strata: Art and Science Collaborations in the Anthropocene’ (Aberystwyth Arts Centre, January 15th 2016). The symposium was supported by the School of Art and the Department of Geography and Earth Sciences at Aberystwyth University, and by the Visualising Geomorphology Working Group of the British Society for Geomorphology (http://www.geomorphology.org.uk/node/1023). Building on the successful ‘Future Climate Dialogues’ symposium (Aberystwyth Arts Centre, June 13th 2013 – see http://cargocollective.com/artscienceclimatechange/Future-Climate-Dialogues-Abstracts), over 25 oral, poster and film presentations focused on art-science collaborations around the nominal themes of ‘Earth’, ‘Water’ and ‘Ecosystems/Life’ (few submissions were received for an intended ‘Air’ session). Even prior to the call for contributions, it had become clear to us that the Anthropocene is already a term that means many different things to many different people. For some, it is a scientific term that carries a precise geological interpretation. For others, the Anthropocene also represents a political project (after all, what better way to make a statement about humanity’s environmental impacts than to name a geological time interval after ourselves?). Many use the term as a convenient catch-all for any form of human influence on the environment, including multifaceted technological and behavioural developments that may not have any significant or lasting geological impact. 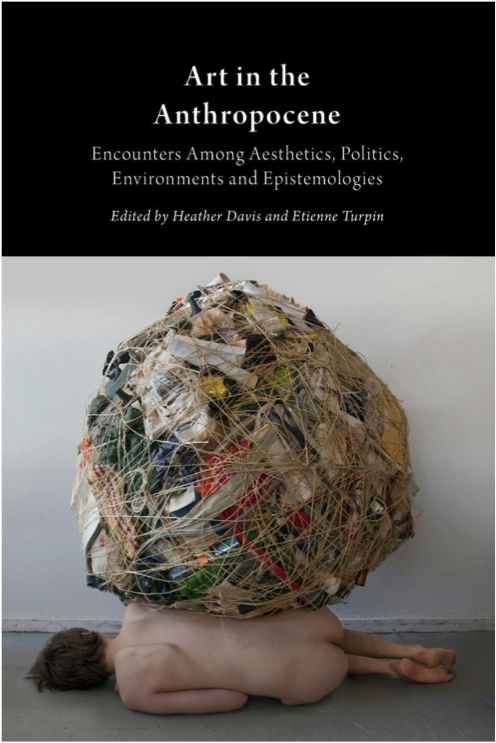 And for others still, the Anthropocene is less a scientific than an aesthetic event; something to be re-imagined as an affective rather than a scientific fact (see, for example, Davis and Turpin’s edited collection of writings about art in the Anthropocene). Key questions that we hoped to address through ‘Strata’ included: i) how are the arts and sciences exploring these multiple meanings, either in isolation or in collaboration? ; and ii) how can we encourage greater art-science collaborations, especially around the Anthropocene theme? The full programme of events, along with the oral and poster presentation abstracts and the biographies of contributors, is hosted at http://cargocollective.com/artscienceclimatechange/Strata-Art-and-Science-Collaborations-in-the-Anthropocene [nb. the plan is to add some images and sound to the site, depending on contributors’ permissions]. Following an introduction by Julian and myself, Dan Harvey (one half of the respected Ackroyd & Harvey artistic partnership) provided the keynote address, drawing on personal examples from a long history of art-science collaborations in confronting environmental issues. One particular work (Ice Lens) has even graced the front cover of the prestigious science journal Nature Climate Change (March 2012). Subsequent presentations – both during the day and in the linked evening session – mined a rich vein of art-science approaches, including those using different combinations of visual art, sculpture, film, poetry, writing, sound and music. Intervening discussion sessions and refreshment breaks provided opportunities for questions and debate. Despite the inevitable time constraints – and the unwanted interjections of a drunken interloper who nonetheless slurred one of the more concise but most scientifically-contentious questions of the day (‘Are we now in the Anthropocene?’) – overall the symposium appears to have been a qualified success. How so? The first of the key questions posed above was addressed more than satisfactorily. The range of presentations at ‘Strata’ provided ample demonstration of the plural meanings now attached to the Anthropocene. Many presentations – highly entertaining and informative though they were – made little or no reference to the term’s original geological meaning. Clearly, the Anthropocene has escaped far beyond these confines, and regardless of whether the term ultimately is formalised as signifying the latest interval of geological time, it is here to stay. As we approach the quincentenary of da Vinci’s death, we now have vastly more ways of sensing the world, some going far beyond direct human experience. Yet in the face of a tidal wave of environmental problems, many brought to greater prominence by the Anthropocene debate, we are still scrabbling for the best ways to see, especially the myriad interconnections. Symposia like ‘Strata’ provide glimpses of the possibilities but remind us that a full view has yet to emerge.